Sometimes you look at a photo and make it into what you think it should be, rather than looking for other clues and 'truths'. There are not a lot of early photographs of the Shortland area looking towards the Una Hill and dating them can be the next challenge. View of Chief Taipari’s House & Grounds. 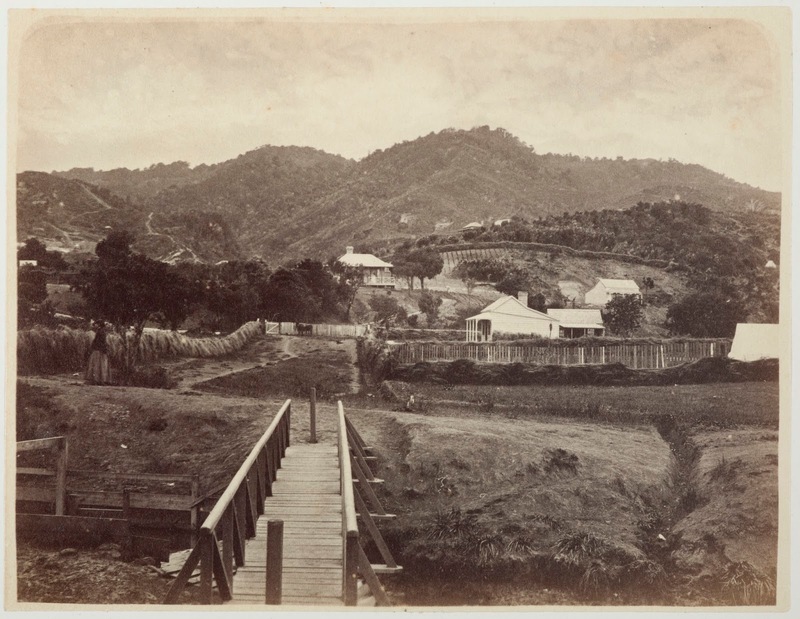 At a quick this glance scene is looking east along Clarence Street towards Chief Taipari's residence on the eastern slopes of Bowen (Rolleston Street). Then you will look closer and see that this is not the house we know as Taipari's, and where is James Mackay's house that should be on the left? 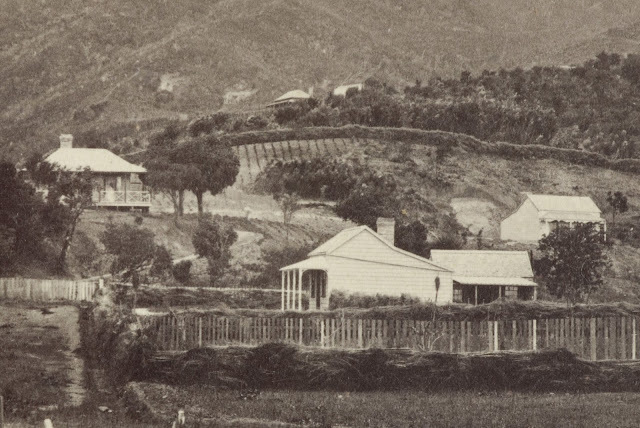 Another view also shows that the Una Hill is relatively untouched from mining, so this in fact makes the photo 1868 before the houses were built. The Daily Southern Cross newspaper holds the answer concerning the house - Chief Taipari had built a home on the hill and then in the early part of 1869, had it replaced with a larger house. This then is the house we recognise in later photographs, and was at the site into the 1950s. Conspicuous amongst the private dwellings in course of erection at Shortland stands the handsome dwelling-house just completed to the order of W. H. Taipari, the lord of the soil at this place. The site is the brow of the hill near the Hape, and immediately behind the township, adjoining the handsome residence of Mr. Commissioner Mackay. The first decent dwelling put up at the Thames was erected on this site for Taipari, but it has recently been removed to make room for the present handsome building. Mr. D. M. Beere is the architect, and the model is highly creditable to that gentleman. It occupies an area of 40ft. by 42ft., and comprises ten rooms, with a verandah round three sides, and when completed is to cost some £1,200. The grounds are to be laid out in first-class style, and four or five Europeans are at present employed on their improvement and laying out. The dwelling is approached from the carriageway in Willoughby street, and the private way leading out of Baillie street, the same road likewise leading to the residence of Mr. Commissioner Mackay adjoining. The building has been put up by Mr. Thorpe, the builder of Mr. Mackay's residence, which is a sufficient guarantee of the excellence of the workmanship and superior finish of the building." Using the cottage on the right hand side of the photos, the two residences of Chief Taipari can be readily identified. The top photo has the pre April 1869 residence and the lower photo the post April 1869 house. So next time you look at an early Thames photo - Stop, look and look again and see what else you can find in the view.